Teachers looking to take pupils outside the classroom to learn about the Anglo-Saxons and the Stone and Iron Ages can book a visit to the Bristol Museum & Art Gallery this autumn. The museum has confirmed that it will run an ‘autumn of archaeology’, linking to a Warrior Treasures touring exhibition running at the Bristol Museum & Art Gallery from 22nd October until 23rd April. There will also be a workshop linking to the Anglo-Saxon period of History running alongside the exhibition. Throughout the run of the exhibition, pupils can learn about the Anglo-Saxons and glimpse parts of what’s known as the Staffordshire Hoard. Warrior Treasures encompasses a collection of gold ornaments studded with blood-red garnets that reveal how an Anglo-Saxon sword was more than just a weapon. Visiting students will learn about how these ornaments signified a warrior’s status, wealth, family and even religious beliefs. A school visit to the exhibition can support History and English studies. A school visit to the Warrior Treasures exhibition can be accompanied by a Stone Age to Iron Age workshop. These last an hour and are suitable for up to 35 pupils in Years 3 to 6. 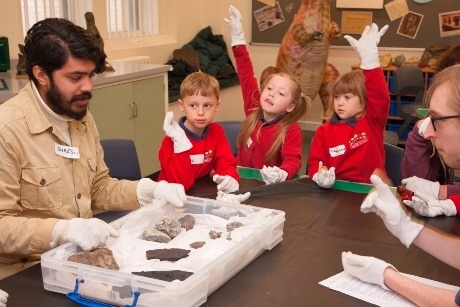 Pupils will handle 700,000 year old flint tools and stone hand axes as part of these learning sessions, and the class will investigate how tools were made and what they were used for and consider what evidence they provide of how people lived in the past. There are two Stone Age to Iron Age sessions available each weekday at 12.45pm to 1.45pm and 1.45pm to 2.45pm between now and 28th April. Further morning sessions may also be available to book. A 20 per cent discount is being offered to teachers who book both a visit to the Warrior Treasures exhibition and a Stone Age to Iron Age workshop on the same day. Teachers can find out more about educational sessions by visiting www.bristolmuseums.org.uk/learning. For further information call www.bristolmuseums.org.uk.